It’s easy to get stuck in a style rut during the winter months, wearing the same solid-color basics over and over. And look, we get it, it can be hard to find new ways to stay warm and look sharp every day. That’s where our Winter 2017 sweater collection comes in. Our range of above-average, get-you-noticed knits is built to keep you your body warm and your style on point, seven days a week—even if all you do is wear them with your favorite boots and jeans. 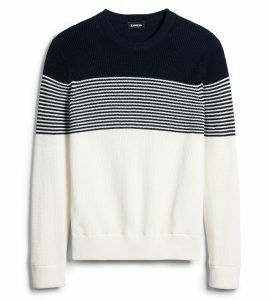 Here is our shortlist of the essential men’s sweaters you need in your stack and when to wear them for optimal style points. The quickest way to squash the Monday Blues is to wear something to work that goes above and beyond a button-down and jeans. 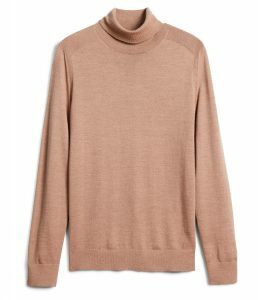 A merino turtleneck sweater in a strong color worn under a slim-cut suit is just the thing to get you noticed by the higher ups. Ours is thermal regulating, so you’ll be comfortable no matter how heated your meetings get, or how cold your office thermostat is set. Bench your basic V-necks for styles that pack more of a visual punch. 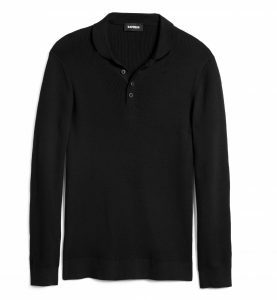 Wear this confident knit sweater with pair of smart trousers and chunky dress shoes for a preppy vibe that makes you look youthful but not inexperienced (especially key if you’re vying for a promotion). The bonus? 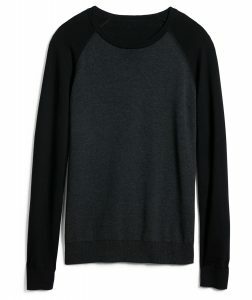 This sweater has a sporty heritage so you can easily wear it with sweats and sneakers on the weekend, too. Wednesdays can be…trying. 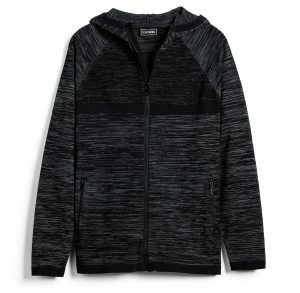 What you need is something that’s just as comfortable as your favorite sweatshirt that also makes you look like a guy who isn’t going to let Hump Day get him down. What you need is a color-blocked cardigan. The sim-cut, thick cotton fabric, and mock-neck collar make you look like you’ve been hitting the gym instead of working late nights, and the graphic colors kick your chinos and slim-cut trousers into high gear. Our hack for making a seamless transition from work to “whatever” after hours? Stick with dark colors from head to toe and you can basically go anywhere and do anything. Yeah, it’s kind of like a super power. Just be sure to mix up the textures and tones in your look ever so slightly so no one confuses you for a bouncer or waiter. This two-tone crewneck gets the job done and then some. Pair it with slim-cut black jeans and your best black boots and you’re in business—and the club. There are plenty of guys who take Fridays as an excuse to slack off but you, friend, are not one of them. Finish the work-week on a strong note with a look that shows you haven’t already checked out. 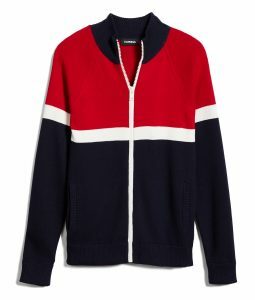 This color-blocked crewneck and a pair of dark jeans or navy wool pants is handsome and confident in all the right ways. It also happens to be ready for your after-work plans too, whether you’re driving out to the country or grabbing a bite at your favorite neighborhood joint. Ah, sweet relief. When Saturday arrives that means it’s time to go into chill mode. That doesn’t mean you get to wear your pajamas to watch the game with your friends, however. More like your favorite jeans, a plaid flannel, and a sweater that’ll keep you warm no matter what you get into. 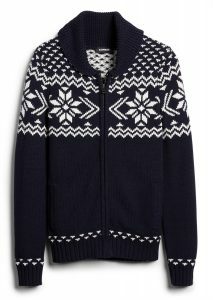 We love a Fair Isle cardigan instead of an ordinary solid-color sweater. Not only does the chunky shawl collar protect you from the cold, but the pattern gives every outfit a festive, ski instructor vibe that’s beyond cool. For busy, get-stuff-done kind of days—gym, laundry, studying, what have you—nothing beats athletic staples and your freshest pair of kicks. Our marled zip-front hoodie is perfect over a simple T-shirt or polo with sweats or jeans. When the weather is lousy, it’s just the layer you need between your coat and your T-shirt. Zip it all the way and pull the hood over your head and nothing can stop you—except maybe a street style photographer.